Some people argue that animals have personalities: shy, bold, aggressive. It's more than just cocktail party conversation for anole lizards, whose risk-taking behavior can mean the difference between life and death. For anoles in the Caribbean islands, natural selection predictably favors exploratory behavior in the absence of predators, and ground avoidance when predators are around, according to a new experimental field study forthcoming in the June 1 issue of Science. "Research on animal personalities has recently generated a lot of interest from all over the world," said Oriol Lapiedra, a postdoctoral fellow with the Centre for Research on Ecology and Forestry Applications in Catalonia, Spain, who conducted this work with Jonathan Losos, the William H. Danforth Distinguished Professor and professor of biology in Arts & Sciences at Washington University in St. Louis, while both were still at Harvard University. "We wanted to figure out if, as happens with morphology, natural selection favors different animal behaviors under contrasting environmental conditions," Lapiedra said. "In recent years, evolutionary biologists have realized that when environmental conditions change, natural selection can rapidly lead to evolutionary change," Losos said. "That means that we can conduct experimental studies on evolution in nature and hope to get a detectable outcome in just a few years," Losos said. "And the Bahamas, with thousands of tiny little islands available to serve as evolutionary test tubes, is just the place for work of this sort." 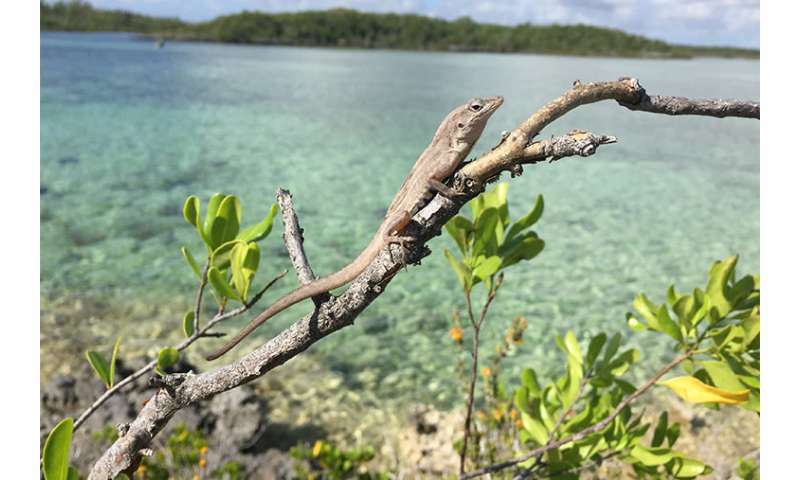 To conduct the experiment, researchers placed 274 adult Anolis sagrei lizards on eight islands in the Caribbean. A recent hurricane had removed lizards from most of these islands; the experimental anoles were relocated from other similar nearby islands. Before they were moved, they underwent a kind of lizard stress test. Researchers placed each anole in a wooden box and put the box on the floor of a container that also held one of the lizard's natural predators—a larger, curly-tailed lizard, Leiocephalus carinatus, itself contained in a clear plastic box. The researchers then opened the door of anole's wooden box so that he or she could see the predator, and also a high, safe perch nearby. After three minutes of eying the enemy, or "habituation," the threatening predator was removed from the container. The researchers gave the anoles a five-minute breather, then the box door was lifted again. The researchers measured how long it took for an anole to emerge from its refuge and start exploring, and the amount of time it spent on the ground before climbing to safety on the perch. Each anole was individually tagged. After a few quick hind-leg measurements, they were plopped down in their new island homes. Anoles on four of the eight experimental islands enjoyed a kind of lizard Shangri-La of predator-free bliss. But on the other islands, those larger curly-tailed lizards were also installed a few days later. After four months, the researchers came back to see how the colonists had fared. The results lined up with what the researchers had predicted. On predator-free islands, the "risk takers"—lizards that were fastest to start exploring a new environment—were the best survivors, perhaps because they were better able to take advantage of food available on the ground. Exploratory behavior did not affect survival on the islands that had predators. Conversely, time spent exposed on the ground was negatively related to survival on predator-inhabited islands, but did not affect survival on the predator-free islands. "Our field experiment showed not only that natural selection acts on behavioral traits, but also that selection for behavior can occur simultaneously to selection on other traits, such as body size and shape," Lapiedra said. Future experiments will need to tackle the question of what happens in the long term. Will bolder lizards have more children and change the population? For now it appears that Mother Nature agrees—luck is usually on the side of those who take chances and risks.